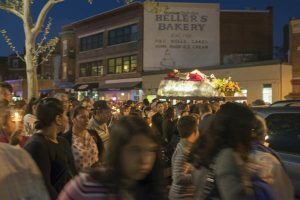 From the Collection: As part of the Museum’s documentation of communities of faith, museum photographer Susana Raab photographed the Good Friday Procession at the Shrine of the Sacred Heart on April 14, 2017. 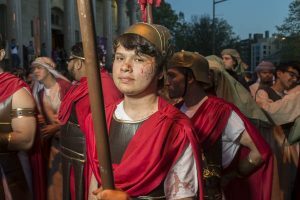 If you spend any time in Latin America around Easter you may be familiar with the ritual of Good Friday processions just prior to the celebration of Easter Sunday. 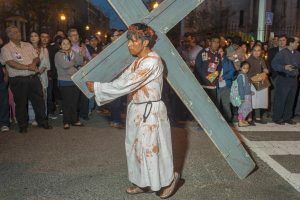 Every year, penitents and clergy gather to reenact the crucifixion, on the path known as the Via Dolorosa, or “Way of Grief” in Latin. Processing on foot, and bearing biers with images of Saints, the Virgin Mary, and Jesus, the marchers perform this act of penance in commemoration of Jesus’ sacrifice of his life for mankind’s sins. 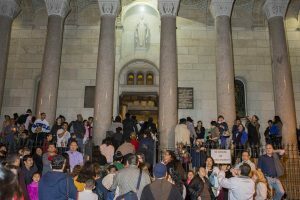 Here in Washington, DC, perhaps no other parish is as identified with carrying on this tradition as the Shrine of the Sacred Heart. Established in 1899, this Roman Catholic church in the Mount Pleasant/Columbia Heights neighborhood of Washington, DC has a long history of social justice ministry. Run by the Franciscan Capuchin Order, it is the spiritual home to many Latin American families, including a large population of Salvadoran-Americans. 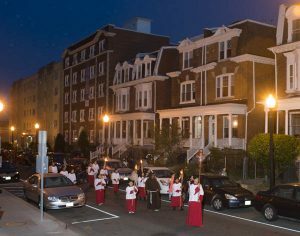 In 2017, the procession began at the church at 3211 Sacred Heart Way, moving past townhomes on Park Road before entering Mount Pleasant Street, continuing on Irving Street NW to 14th Street NW in Columbia Heights, and forming a loop that ends at the church. Numbering several hundred people, the procession travelled in a wide loop, traversing through the Mt. Pleasant neighborhood before reaching 14th Street in Columbia Heights on Park Rd. 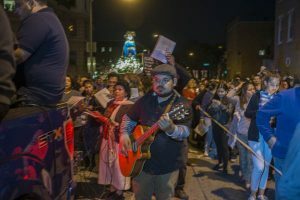 Various songs and hymns were sung in different languages within the procession, representing the Latin American, Vietnamese, and Haitian immigrants who have found a spiritual home at the Shrine of the Sacred Heart. A Haitian man held his hand to his heart as he brought the Virgin Mary back to the Church at the end of the procession. Over an hour later, the parishioners return the Shrine to say Mass on after the Good Friday Procession. The procession walked past row houses on the streets of Mt. Pleasant before heading through the central commercial district on Mt. Pleasant Avenue. 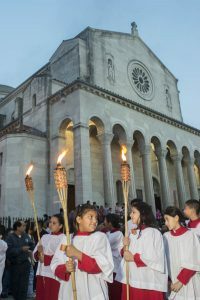 The youngest penitents in the procession dressed as shepherds. 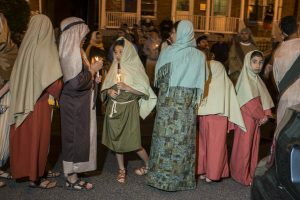 A life-size Jesus in a coffin was borne on the backs of a group of men, who carried their heavy burden while singing hymns in unison with the crowd that grew in numbers as they approached the heart of Mt. Pleasant on Mt. Pleasant Street. 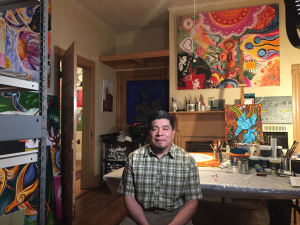 During the research process prior to the opening of Gateways/Portales, I had the pleasure of meeting with the artist Cornelio Campos his Durham, North Carolina home-studio several times. I got to sit among his vibrant paintings and works-in-progress, and learn about this soft-spoken artist’s journey. Born in Cherán, Mexico, he arrived in the United States in 1989, moving first to Los Angeles where he worked in construction. Eventually he moved to North Carolina in 1992 after hearing of better job prospects from a cousin. He moved to Epson, North Carolina, where he did farmwork. He later transitioned into landscaping and moved to Durham. He currently works as an alarm installation specialist in addition to being a well-known artist in North Carolina. He has been featured in many group and independent shows, as well as community events throughout the state. In 2015, the archives at the Durham County Library accessioned and are continuing to build Campos’ archive. His papers include correspondence, sketches, purchase invoices, institutional partnerships, his many exhibitions, as well as commissions, including one for noted Chilean author Isabel Allende. 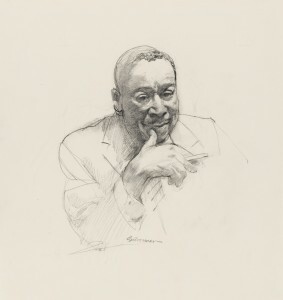 The archive details the depth of his artistic career in addition to his importance in the state of North Carolina as a whole. Like Campos, many Latinxs found steadier, non-seasonal work, and ended up making Durham their home. The Southeastern United States is currently experiencing some of the largest Latinx population growth in the country. 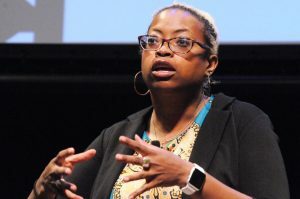 This growth, particularly in urban centers like Durham, is challenging and changing the black-white binary that has dominated the Southeastern United States for decades. Campos’ painting Realidad Norteña (the Reality of the North) helps document that change, as well as confronting viewers with the realities of the immigrant experience. Campos’ body of work visualizes and examines both the geographic and cultural borders between Latinxs and the larger United States population. Like the “Big Three” Mexican Muralists before him, (Diego Rivera, David Alfaro Siqueiros , and Jose Clemente Orozco), his large scale paintings feature workers and the marginalized as subjects, with social justice as their themes. Campos aims to visualize the dangers and difficulties that people experience not only in crossing the border into the United States, but the severe circumstances that lead to such a decision. 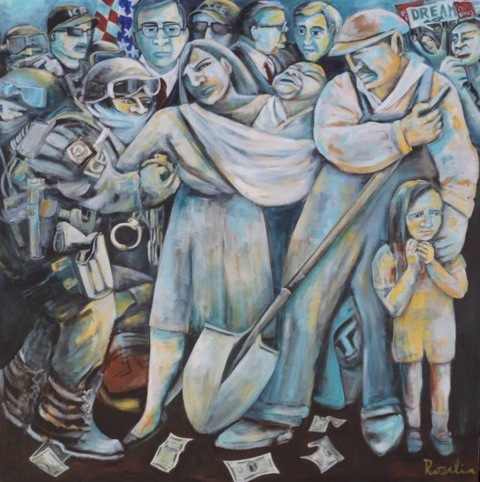 Realidad Norteña (the Reality of the North) was painted after Campos became a United States citizen; he describes it as his most personal, autobiographical piece. 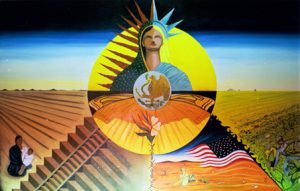 The central image of the painting is a female figure that fuses the Virgin of Guadalupe, symbol of Mexico on the left, and the Statue of Liberty on the right, in a rising sun. The rays of the brown Virgin’s mandala mirror the blonde Statue of Liberty’s crown. In the center of the female figure’s chest is a hybrid seal that combines the U.S.’s bald eagle and Mexico’s emblem of a golden eagle devouring a rattlesnake. The eagle stands on a combination of Mexico’s prickly pear cactus and the U.S. olive branch. Spanning the female figure and bridging the two halves is a monarch butterfly, symbol of migration. Beneath the monarch is an orange lily blended with a white flowering dogwood blossom, state flower of North Carolina; the stem of the flower is stylized barbed wire that bisects the bottom of the painting. On the left of the picture plane, Campos has depicted a mother and child seated in an arid, barren Mexican landscape which merges with the steps of a Pre-Columbian temple. On the right is a segmented landscape, divided from the Mexican side by the barbed wire. In the segment closest to the wire is a desert littered with bones and a faceless, contorted figure, waist-deep in the sand, gazing up at the U.S. flag. Just beyond the flag is a verdant, lush field, tended by hunched farmworkers. During a September 2016 visit to Campos’ home, he brought out a faded cardboard box. When he lifted the lid I gasped when I saw the contents: the boots he wore as a farmworker when he first came to North Carolina. He then brought out a small, tissue-thin envelope which held his ticket from his journey from Mexico to the U.S. 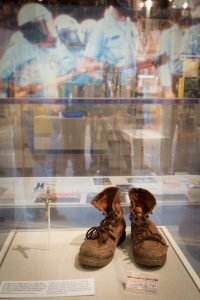 Both the boots and ticket stub are displayed together in the introductory section of Gateways/Portales. The dusty, weathered boots add an even greater weight to Realidad Norteña, hung just across the gallery. In his video interview for the Gateways/Portales exhibition, which will be part of the ACM permanent collection, Campos discussed how people on opposite ends of the political spectrum have reacted to his work. 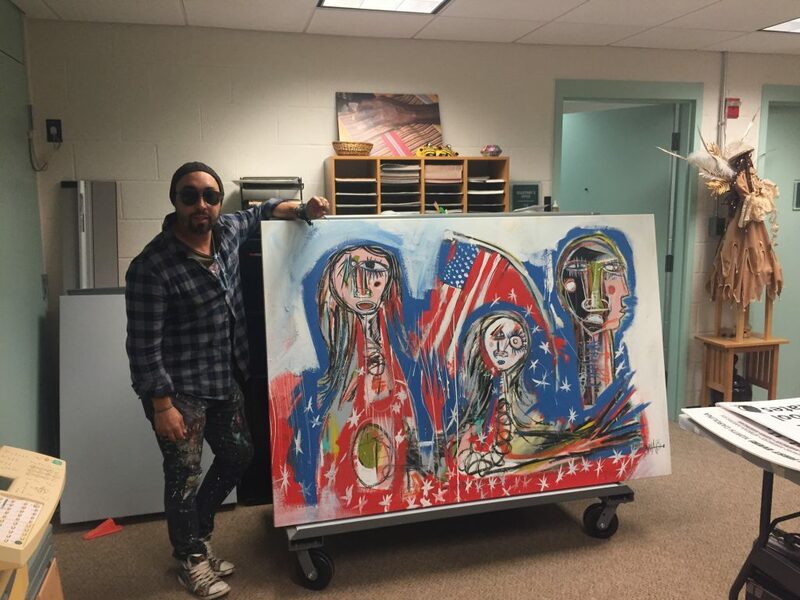 Shrugging and smiling, Campos noted that he received an intense amount of anti-immigrant backlash when the University of North Carolina, Chapel Hill bought and displayed his work, but despite the negative feedback, he was pleased that his art was sparking discussion. He says he sees his work as a form of visual documentation, and as he says, “cultural diplomacy”. In addition to the University of North Carolina, Chapel Hill, Campos has worked with several institutions throughout the state including Duke University, Johnston Community College, Peace College, North Carolina State University, and Smithsonian affiliate North Carolina Museum of History to try and educate and create a dialogue between the Latinx and the non-Latinx communities. 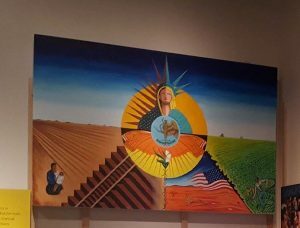 Realidad Norteña has recently been acquired by ACM, and will be on display as part of the Gateways/Portales exhibition, on view until August 6, 2017.
and Latino art. She is also fascinated with the evolution and uses of Marian imagery in the Americas. In 2014, she was a recipient of the Smithsonian’s Latino Museum Studies fellowship, working with the Teodoro Vidal Collection at the Lunder Center and the Smithsonian American Art Museum. Currently she is a research assistant at the Anacostia Community Museum, working on the exhibition Gateways/Portales, which examines Latino im/migration in the D.C. Metro Area, Baltimore, the Raleigh-Durham region of North Carolina, and Charlotte, North Carolina. Cornelio Campos is a self-trained painter from Cheran, Michoacan,Mexico who now resides in Durham, North Carolina. He has been painting since childhood, although the strong themes present in many of his paintings did not surface until he became an American citizen as an adult. His earlier works show a Mexican folkloric influence, whereas his more recent works are quite contextual, mixing ancient and modern styles, themes and images. Campos paints with a passion for educating others, primarily on the migrant experience, and for sharing the customs and culture of his people, Purepecha from Cherán. His work has been shown at exhibits throughout North Carolina, including Duke and UNC – Chapel Hill, where some of his pieces are permanently on display. On this day in 1531 the Virgin of Guadalupe was said to have appeared in Mexico to an indigenous man, Juan Diego. The dark-skinned Guadalupe is often interpreted as a coming together of Spanish and indigenous cultures in Mexico. Her name, Guadalupe is the Spanish pronunciation of the Nahuatl name Coatlaxopeuh, a Mesoamerican fertility goddess. Her appearance to an indigenous man in the New World further rooted Guadalupe to the specificity of this place. The Virgin of Guadalupe is a powerful religious and cultural icon for Mexico and Mexican-Americans. Her green mantle and golden mandala are readily recognizable to people outside of those groups. 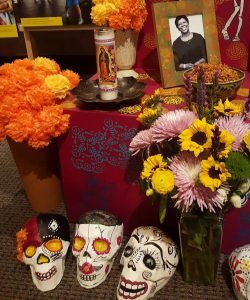 She is not only a visualization of faith, but also a symbol of nationalism, cultural pride, and resistance for those in Mexico and beyond its national borders. Of the four areas explored in Gateways/Portales, Mexicans are the dominant Latinx group in Baltimore, Raleigh-Durham, and Charlotte. In Washington, D.C. metro area, Mexicans are second to Salvadorans. As a result of Mexican migrations throughout the US and the power of her imagery, Guadalupe appears in various iterations throughout the Gateways/Portales exhibition. She is representative of Mexico in Cornelio Campos’ autobiographical painting Realidad Norteña in “Social Justice & Civil Rights”. 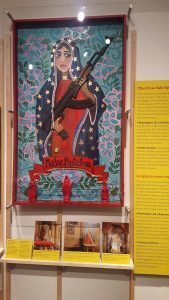 She is reimagined as an armed millennial in Rosalia Torres-Weiner’s Madre Protectora displayed in “Making Home and Constructing Communities”. 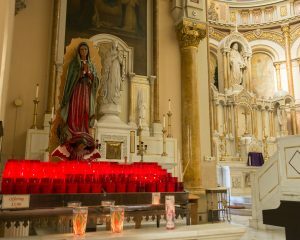 Displayed beneath Torres-Weiner’s painting is a photograph of the altar dedicated to the Virgin of Guadalupe in Baltimore’s Sacred Heart of Jesus Church. 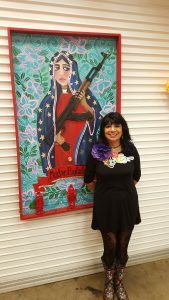 Artist Gabriela Lujan placed a candle emblazoned with the Virgin’s image on the Day of the Dead altar in the “Festival as Community Empowerment” section. High in the festival portal is an image of a diablo dancer resting on the base of an handmade altar for the Virgin after a performance in Durham, NC on her feast day. La Virgin de Guadalupe was declared the patroness for the entire Continental Americas by the Catholic Church in 1945. Though she is most often associated with Mexico and Mexican-American culture, she was not specifically designated as the patroness for Mexico until 2002. 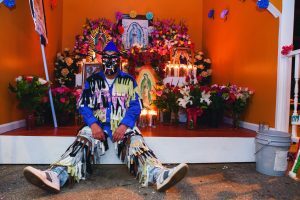 Guadalupe acts as a sort of cultural glue in the U.S., with her imagery and associated ceremonies being transplanted, creating a sense of community and solidarity among her devotees in Mexico and beyond. December 12th marks the Feast of Our Lady of Guadalupe in the United States! written with Elena C. Muñoz, research/curatorial assistant for the Gateways exhibition. Today is Mother’s Day in Panama! Most people know that I am Panamanian. Orgullosamente! 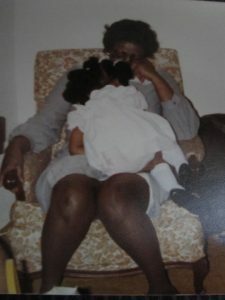 Only some people know, however, that my father is Panamanian and my mother is African-American. Interestingly, this did not factor into Gateways until a meeting with Charlotte based artist Nico Amortegui. Nico, born and raised in Bogotá, Colombia, has lived and worked in the United States since the late 1990s. He is quick to say, one of the main reasons he is here and that he lives in Charlotte is his wife and two daughters. Early in our exhibition stages when I was deciding what the salient themes were and how they would be represented, I met with Nico in his studio. We discussed some of his recent work, the growing population of Latinx in Charlotte, Latin American vs Latinx, and the restrictive focus on Latin Americans/Latinxs. THAT was the inspiration for his piece in Gateways: He wanted to create a piece that focused on Latinxs, but one that included space for his wife – who is not Latina- and his children. It is based on the fact that when we talk about Latinos we blur out the Americans (United States) that have embrace the Latino culture and have made it part of their life. This beautiful work is in the “Making Home, Constructing Communities” section of the exhibition, but the message resonates throughout the whole exhibition. When we fight for social justice and civil rights, when we build networks, when we celebrate our communities we do not do this alone. It is never ONLY the Latinx community and it is never only FOR Latinx communities. 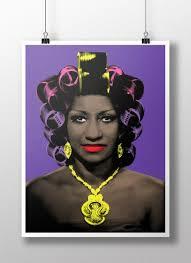 Born Úrsula Hilaria Celia de la Caridad Cruz Alfonso, the Queen of Salsa is better known as Celia Cruz. The importance and significance of this music legend cannot be understated. She is represented all over the Smithsonian including the National Museum of American History , National Museum of African American History and Culture, National Postal Museum , Smithsonian Folkways, and the National Portrait Gallery. Every museum has a unique mission and thus interpretation of history and culture. 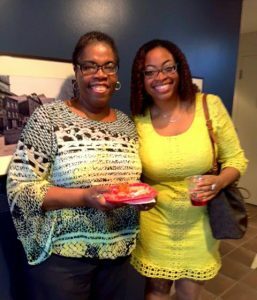 The Anacostia Community Museum’s mission focuses on urban history and culture. The next exhibition to open will be Gateways. Visitors to the upcoming Gateways exhibition will see an urban interpretation of the icon. M. Tony Peralta, a child of Dominican immigrants, was born and raised in the uptown neighborhood of Washington Heights, NY. Being raised in New York during the hip-hop generation greatly influenced him and his work. What does Celia Cruz have to do with Gateways? The exhibition will boast the 37″ x 42″ canvas rather than this poster version. But enjoy this preview! You can hear Tony talk about this piece and his work when Gateways opens December 5th. Sustainable Community Preservation Award – winner! 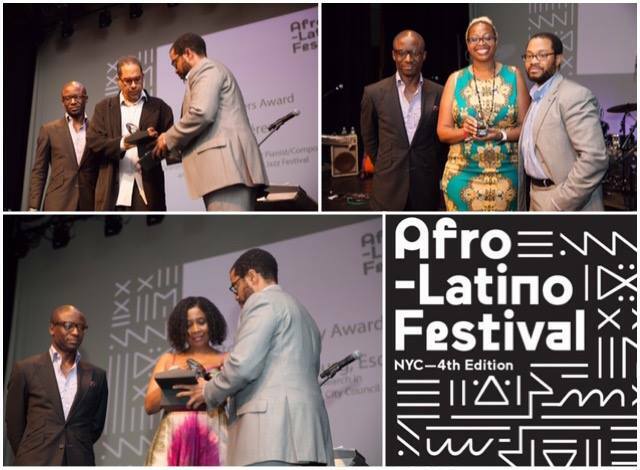 Only July 8th I had the pleasure and great honor to attend the Afro-Latino Festival of New York where I received an award for Sustainable Community Preservation from the organizing committee. We gathered on that hot summer day under the heaviness of the recent killings of Alton Sterling and Philando Castile just days before. The mood was at once somber, buoyant, aware, powerful, and gentle. For many of us, that was the collective safe space we needed to emote, process, heal, and plan. I served on a panel, Afrolatin@S, ¡Presente! 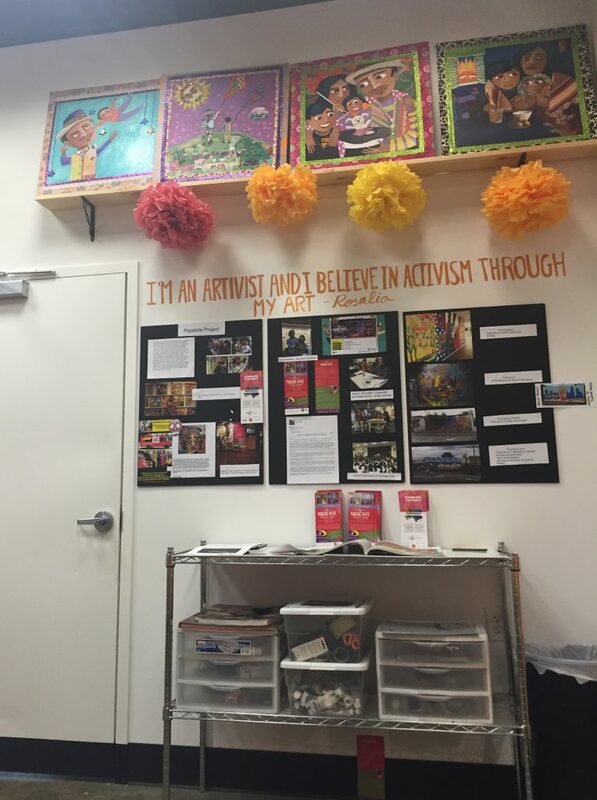 : Representation And Cultural Heritage where I discussed the work I do at the Anacostia Community Museum, but really, espoused some of my philosophy about Afro-Latinx representation and cultural heritage more broadly. The full day’s recordings are available via the Schomburg’s livestream site. When I first started at the Smithsonian people would introduce me as a curator of Afro Latino studies. I was quick to correct them. I am proud to be Afro Latina but I am a curator for Latino Studies. 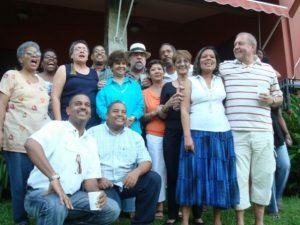 Latino studies includes Afro-Latinos. We do not always need to be separate. The responsibility for knowing our history and culture should not be pushed off to a few. And, we cannot claim Latin America or the U.S. as spaces of mixedness, as spaces with African roots, then deny our contemporary existence and inclusion of Afro Latinos within larger contexts. My contributions to the Smithsonian, or to anywhere I am, do not begin and end with my physical Blackness and my value to this world does not lie exclusively within the nexus of Blackness and Latinidad. I am interested in representing community stories within American stories. Latino history and culture include Afro-Latino stories. Plural. We are not all the same. Our diversity matters. 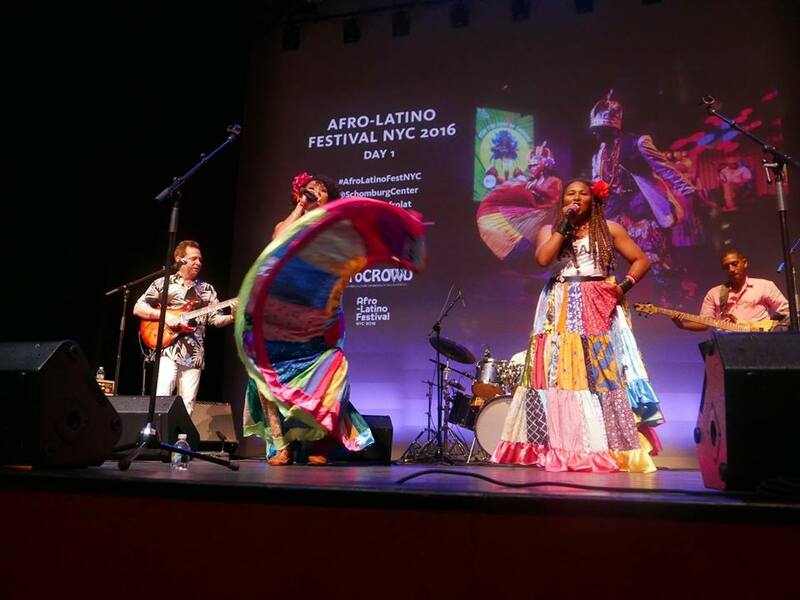 The award ceremony and performances were Friday evening, also at the Schomburg, following a reception. As you can see from the image below, I was in the company of some heavy hitters. 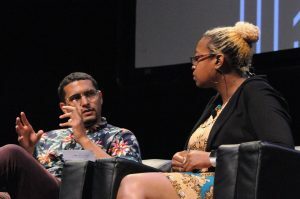 When I emailed people after the event I confessed: I am elated to share any honor with (fellow Panamanian) Danilo Perez. I kept my acceptance speech very short. I will admit, I was overcome with emotion in a way I did not expect and I feared my voice would betray me. I am not generally a crier but looking out at all of the faces, including my parents and my sister, I teared up! I know that I work for and represent an institution that has historically excluded us. But I also know how powerful it has been for people to see someone that looks like ME doing Latino-centered work in this institution. The Smithsonian is responsible for telling the American story and I am responsible for making sure we are included. When I think about the people I want to be proudest of what I do, moved by this work, it is people who feel I am telling their story. Our story. I have had some wonderful days in my personal and professional life, but receiving this honor is among the top. 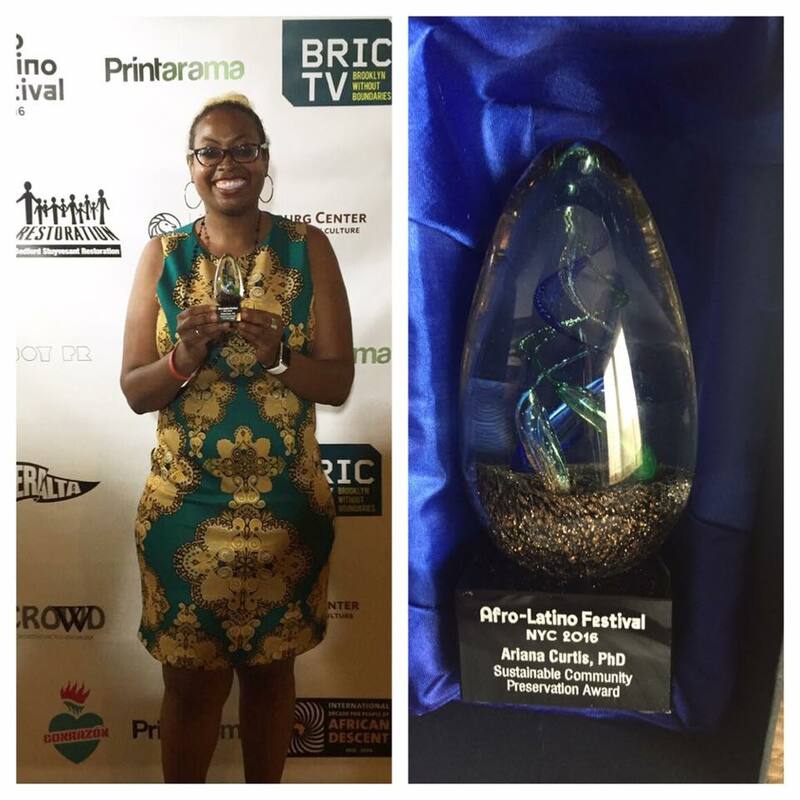 Thank you so much to everyone at AfroLatino Festival for considering me, with a special shout out to (fellow Panamanian) Amilcar Priestley. After the ceremony, I was able to sit back with family and friends and enjoy the rest of the night and the weekend festivities. For those that missed out, see you next year! Charlotte, North Carolina has been on our minds and in our hearts these past few days. 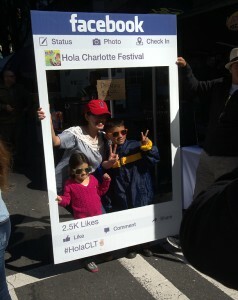 In an act of community and resilience, it felt appropriate to celebrate both the city of Charlotte and Latino Heritage Month in the next few blog posts. It has been an honor and a pleasure to work with Rosalia. She is a talented Mexican born and raised, Charlotte-based artivist (artist+activst). Her energy, creativity, thoughtfulness, and commitment to social justice and community stories pervade all aspects of her life and work. I am excited for visitors to get a small glimpse of this in Gateways. I am the curator, but the other (invaluable!) member of the Gateways team is research/curatorial assistant Elena C. Muñoz. 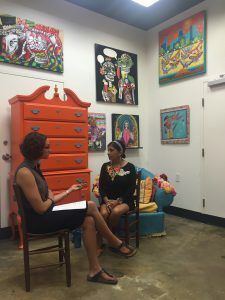 On our trip to Charlotte last week, Elena sat down and spoke with Rosalia about her art in general, and our recent acquisitions in particular. As an art historian, Elena has a deep knowledge of this work. 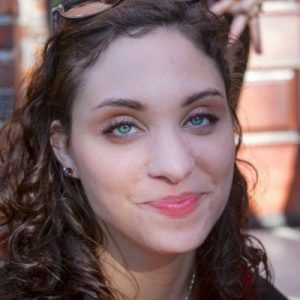 Below, please find Elena’s post about the first piece we will show: Uprising Against ICE. Many of Torres-Weiner’s pieces deal with the complexities of the United States immigration system as well as the injustices and dangers immigrants often face. 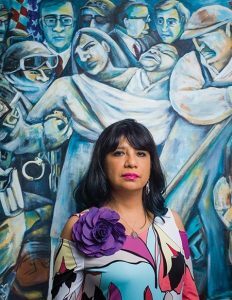 Her latest series of ten large format paintings that depict both the contributions and struggles of Latino immigrants in the United States. 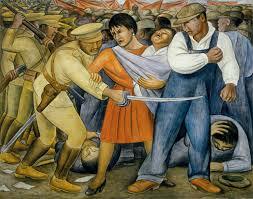 This painting is a reimagining of one of Diego Rivera’s Mexican Revolution masterworks, The Uprising (1931). Torres-Weiner’s paintings are typically bright, colorful pieces. This particular piece is painted in blues and grays, alluding to the ICE of the title. For this painting, the artist has abandoned her usual style and has instead mimicked both the style and composition of Mexican muralist Diego Rivera’s The Uprising. Like Rivera’s painting, Torres-Weiner’s piece features a crowded and compressed picture plane, with a family unit battling an authority figure at the forefront. Torres-Weiner has replaced Rivera’s soldier with an Immigration and Customs Enforcement (ICE) agent in full SWAT gear, reaching with handcuffs towards a humbly dressed, unarmed immigrant family. Like Rivera’s female protagonist, Torres-Weiner has depicted a mother holding her swaddled child, arm outstretched to protect her family. Her husband protects their older daughter to the right of the canvas. The daughter, not present in the Rivera original, is yellow, the color of hope. The father creates a barrier between himself and the agent with a farming spade, reminding the viewer that immigrants perform much of the farm labor in the United States. To the left and behind the agent are more ICE agents and U.S. government officials in suits and ties. On the ground between the family and the primary agent is another figure and dollar bills, both trampled underfoot. Behind the immigrant family is a crowd of protesters, from which a “DREAM” sign can be seen, referring to the Development, Relief, and Education for Alien Minors (DREAM) Act that failed to pass. In the background is a U.S. flag, a bright contrast to the icy blues and grays of the rest of the work. In the 1990s, North Carolina led the U.S. in Latino population growth. The southeast U.S. is one of the fastest growing regions in the country, in overall population and Latino population. In January of 2016, there were several ICE raids throughout the Southeast, resulting in the detention of 121 people, most of whom are women and children. The relationship between law enforcement and North Carolina’s Latino population is strained and fraught with anxiety, especially for undocumented families. Uprising Against ICE gives voice to this anxiety while also subverting it. Torres-Weiner reimagines a family being held together through their own power and through the support of the masses that revolt behind them. Elena Muñoz received her MA in Art History from Rutgers University, and her BA in Art History from Fordham University. Her primary research interest is teasing out the African influences in Latin American and Latino art. 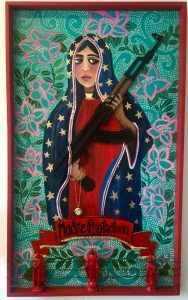 She is also fascinated with the evolution and uses of Marian imagery in the Americas. In 2014, she was a recipient of the Smithsonian’s Latino Museum Studies fellowship, working with the Teodoro Vidal Collection at the Lunder Center and the Smithsonian American Art Museum. Currently she is a research assistant at the Anacostia Community Museum, working on the upcoming exhibition Gateways, which examines Latino im/migration in the D.C. Metro Area, Baltimore, the Raleigh-Durham region of North Carolina, and Charlotte, North Carolina. On this date in history 62 years ago today, the landmark case Brown v. Board of Education of Topeka, KS made school segregation unconstitutional. This case transformed the lives not only of African-Americans, but was preceded and followed by justice for Black and Brown U.S. citizens around the world. Highlighting these connections takes nothing away from Black struggles for Civil Rights in the United States. On the contrary, the intent is to demonstrate that past, present, and future struggles for Civil Rights have never been for or by one group alone. Discrimination and segregation in the United States have never been strictly Black-White experiences. The discrimination against Mexican-Americans, especially on the west coast of the U.S. was rampant. A case in California eight years before Brown set a necessary precedent for Brown vs the Board of Education: Méndez vs. Westminster . Understanding that legal decisions and civil rights transcend state, racial, and ethnic lines, Mendez’s counsel and support included: League of United Latin American Citizens (LULAC), the National Association for the Advancement of Colored People (NAACP), American Jewish Congress, American Civil Liberties Union (ACLU), and the Japanese American Citizens League. 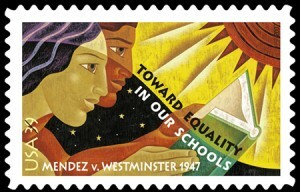 When Thurgood Marshall represented Linda Brown in Brown vs. the Board of Education, he used arguments from the Méndez case. The relevance — segregation based on color and origin — was clear. We often think of U.S. law within the physical confines of the United States. But what about U.S. territories? Such was the case of the Panama Canal Zone. The Panama Canal Zone was a U.S. territory from its creation in 1903 until the Panama Canal Treaties of 1977 mandated the Zone’s dissolution in 1979. The United States was a racially segregated society. U.S. society at the time included the U.S. Panama Canal Zone, as the Zone was governed completely by U.S. laws. Segregation existed in the U.S. Panama Canal Zone. Manuel Sandoval, DC resident, recalled the separated spaces existed along both race (“Black” and “white”) as well as citizenship (“Panamanian” and “American”) in Panama during his interview. After the landmark decision of Brown vs. the Board of education, citizenship, not race, became the primary source of inequity in the U.S. Panama Canal Zone. Black and white U.S. citizens integrated. This law only applied to U.S. citizens. Zonians (the term for people living in the Canal Zone) of Panamanian or West Indian citizenship remained segregated from U.S. citizens in school and housing, with some exceptions, such as the Canal Zone College. Latin American schools and thus Spanish language instruction replaced U.S. based school with English language instruction for non-U.S. citizens. This language change was especially problematic for West Indian children from English speaking islands, as many did not speak Spanish at home. Between 1960 and 1970, Panama had the largest number and percentage of Central American immigrants to the U.S. The change in language of educational instruction in Canal Zone schools was certainly a factor. Although raised in New York, Dr. Kenneth Bancroft Clark was born in the Panama Canal Zone. Dr. Clark was the first Black Ph.D. recipient from Columbia University, the first Black president of the American Psychological Association and the first tenured Black professor at the City University of New York. Dr. Clark is best known for his psychology experiments colloquially known as “doll tests.” He and his wife, Dr. Mamie Clark used four dolls, identical except for their color, to test kids’ racial perceptions. Children ages 3-7 were asked to identify the dolls and express preference. The majority of the children preferred the white doll, assigning positive characteristics to it and negative characteristics to the darker doll, deemed undesirable. These tests were prominently cited in the 1954 case Brown v. Board of Education of Topeka, Kansas as evidence of the psychological effects of racial segregation on Black children’s self-esteem. It was one of the first times social science research was used in legal proceedings (Méndez vs. Westminster also drew on social science research). Less cited conclusions from the Drs. Clark’s “doll tests” included that racism is an inherently American institution and that school segregation also hindered the development of white children. Given the news that U.S. schools are re-segregating, these lessons are more important than ever. More about the Washington D.C.’s connection to Panama, the Panama Canal Zone, and this story of Kenneth Bancroft Clark can be seen in the exhibition Bridging the Americas: Community and Belonging from Panama to Washington DC in the Anacostia Community Museum Program Room. It is up indefinitely. Charlotte, North Carolina. The Queen City. A major emerging immigrant center. One of the fastest growing cities in the U.S. A minority majority city. A city with a rapidly growing Latino community. It is one of the cities that will be highlighted in an upcoming exhibition, Gateways. North Carolina led the nation in Latino population growth in the 1990s with a nearly 400% increase in its Latino population. Initial Latino immigrants and migrants were largely working class but those numbers have since shifted to include more professionals as the population of Latinos continues to grow. To help the city deal with rapidly shifting demographics, the city of Charlotte created an Immigrant Integration Task Force in 2013. This group, appointed by the city, explores ways to make Charlotte more immigrant friendly and integrative. Though the task force and national news reports focus on the entrepreneurial integration of immigrants and economic impact, Gateways will begin conversations of community integration at more basic levels. Family units have been separated by policies such as Secure Streets and Secure Communities that provide overlapping authority between local law enforcement and federal immigration agencies. Between 2009 and 2016 more than 2.5 million people were deported. Earlier in 2016, raids by ICE (Immigration and Customs Enforcement) focused on Georgia, North Carolina and Texas. What does this look like? What does this mean? How do we stop seeing policy and instead focus on people? Words are powerful emotive tools. Gateways, opening in December 2016, explores the triumphs and struggles of Latino migrants and immigrants in four urban destinations: Washington, D.C., Baltimore, MD, Raleigh-Durham, NC and Charlotte, NC.